What’s your excuse? Welcome to Marketing For Owners Episode 14. What’s your excuse? Or, as the great Tony Robbins would put it, what’s your story? All of us have excuses or stories for everything. Everything that goes wrong. We don’t ever have one for everything that goes right, but we have it for when it goes wrong. But why? 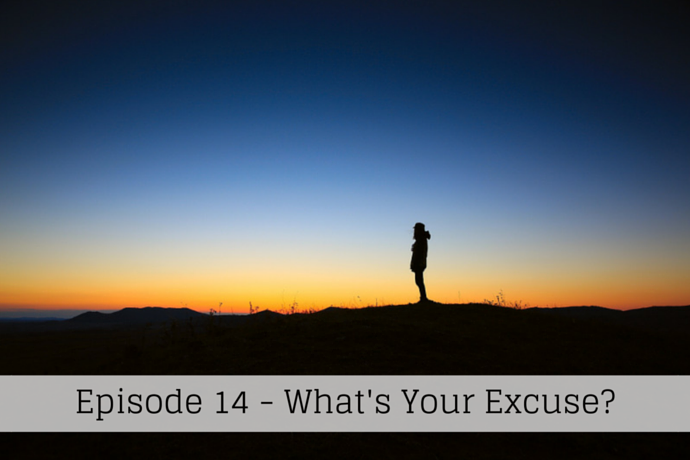 Everyone makes mistakes; everyone fails at some point in their life so why make excuses? Don’t worry. Take the blame. Accept failure. Do not think that you have to pass the blame. Blaming someone else is not fair. And unfortunately, I’ve got bad news. When you’re the boss, it’s your fault. You know the phrase, “the buck stops here”; and it stops at the top. It’s your fault. When they say, heads will roll it’s your head. But heads don’t have to roll. Things that go wrong just need fixing. I want you to think of it as, when I say your fault, that’s looking to blame someone and you are going to blame yourself. Don’t blame anyone. If something goes wrong or, rather, something doesn’t go right, then it just needs fixing. If it’s something that others have done, it just needs fixing. Don’t bang yourself about for not getting it right the first time. Don’t blame others. Because if they are, if you’ve given the adequate training, if they’re doing it in a way that you wanted it doing, and it didn’t work, you need to think of another way. But, first, you need to have another go. Perhaps first time lucky didn’t work for you. Perhaps second time will but if people did not do it in the way you want it, then you didn’t explain it properly. It’s down to you if you want your company to succeed and grow. You have to lead from the top, and you cannot apportion blame. You must accept that it’s you but like I said, don’t worry about the term “failure”. Failure is just a path to success. Failure is trying something over and over until you get it right. So consider that the next time you want to blame someone. Being a Thursday, it’s time for a Drivetime Podcast recommendation, and this week we have a fantastic one. They last a bit longer at around an hour but they are packed with content. The podcast is called I Love Marketing with the fantastic Dean Jackson and Joe Polish. They have great banter; Dean is an incredibly clever guy, but he always seems to be having the mickey taken out of him by Joe. Joe has got a wicked dry sense of humor. He could almost be English. But the quality of the marketing information is undeniable so go look it up on iTunes. They have got a website ilovemarketing.com, and you can listen to them there. I recommend it. The people at New Rainmaker sponsor this show. Rainmaker is the platform that not only stores this podcast before it goes to iTunes, it powers our whole website so go take a look.